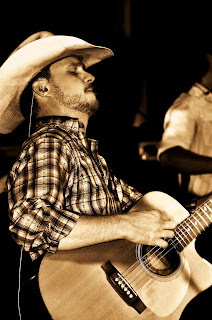 Red Dirt - Blue Collar: CoJo... get 'em boy! Still a young pup at 23, Cody Johnson may still be a relative new comer to the Texas music scene, but that hasn't stopped him from quickly becoming a top dog. In a few short years he has gone from an opening act to headliner packing in large crowds at bar rooms and dance halls all across Texas. His honest and heartfelt lyrics, coupled with the raw energy in his stage shows, quickly solidified a place for Cody at the head of the pack. He formed his first band in high school and after graduating he hit the circuit of Texas honky tonks and bar rooms, paying his dues and honing his craft. He isn’t cliché and nitchy like some of the "artists" cashing in on the Red Dirt scene right now today. His music has an old school true country feel to it that seems to pay homage to the true troubadours that came before him. Cody has listed George Strait, Pat Green and Willie Nelson as some of the artists that influenced him early on. That’s a pretty good group of guys to pull inspiration from and it shows in the honest and real lyrics in his songs. His live shows are fierce. I have been lucky enough to see him in concert and it was unreal. He hits the stage with a passion for music and a raw energy that keeps him running 1000 miles an hour through his entire set. Cody has said that there was a time where he was unsure if music was what he was meant to do. But the roar of a crowd at the legendary south Texas venue Greune Hall one night changed all that. When he walked out and asked "Are y'all ready to party tonight?" and people just went nuts, he was hooked he told his band "This is it boys. I'll never do anything else." I would like to thank that Greune Hall crowd that night for that. He is currently co-headlining a tour with fellow Texas music chart topper Kyle Park and from what I hear, this is a show that you do not want to miss. His first CD "Black & White Label" helped pay some bills and keep the band on the road for a while. But it was Cody's second CD “Six Strings One Dream" that contained the break out hits that would push Cody into the fore front Texas music scene and make him a regular attendee on the Texas Music Charts. "Nobody to Blame" "Pray for Rain" "Texas Kind of Way" were all top 10 hits for Cody with "Texas Kind of Way" going to #1. The current single "Diamond In My Pocket” off of his most recent release “A Different Day" has gone into the top 10 as well, sitting at #5 as I write this. Cody is on one hell of a roll these days and it seems he is just chomping at the bit for more. CODY JOHNSON "DIAMOND IN MY POCKET"